The emails tell the story of a cable news network coordinating with the mayor of a failing city who is also a rising Democrat star. The apparent goal of "Chicagoland" was for CNN to use its resources as a way to portray the "mayor in a positive light" at a national level and showcase Emanuel "as the star he really is." "Chicagoland's" executive producer is Robert Redford. CNN has yet to comment on the scandal, but this is yet another black eye for Jeff Zucker, who has been in charge of CNN for just a little over a year. Under his leadership, CNN has become a laughingstock, even among its left-wing colleagues in the mainstream media, for its bungled attempts to cover serious news and bizarre obsessions with whales, missing planes, and ferry disasters. Just last year, CNN was caught using its network to push anti-gun legislation. CNN presents itself as an objective cable news outlet. Time Magazine and the Enshrining of Mayor Rahm Emanuel: Can a Media Hero Do Any Wrong? Mayor Rahm Emanuel, at the helm of arguably the most corrupt city in the nation, has an image challenge. He has created enemies left, right, and center in the name of budget cuts while racking up spending on pet projects for the 1% like a maze of protected bike lanes through the city. His notorious temper and connections to the embattled Obama “Chicago Way” Administration risk forever tainting his turn in charge. 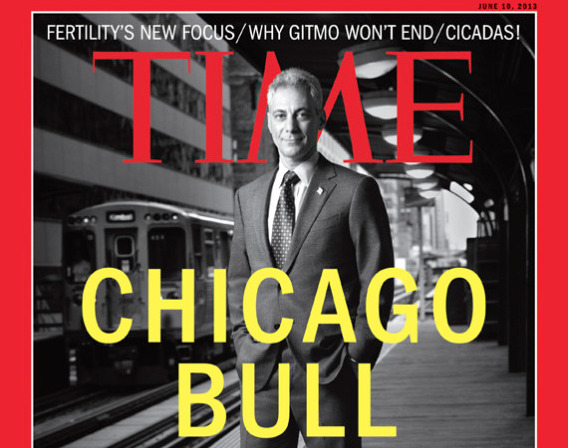 Enter Time magazine, whose June 10 cover story on Chicago Mayor Rahm Emanuel presents a controversial figure who, though under attack, is made of heroic mettle, and therefore impervious to petty questions about school closings and massive government expenditures. No, with Time’s help, Rahm will be protected by the media in the same way so many others before him have: through a sort of enshrinement afforded to a “character” like him. The Time piece is replete with references to his “Godfather” image, referring to him as “the guy who has picked the fights his predecessors avoided.” Time’s cover is equally bold, presenting him as a tough guy in black and white, dominating the gritty city scene behind him. Mayor Daley was always said to “get the roads plowed,” and with this, he was issued a monumental pass for his mobster-like rule over the city. A tactic that worked, and that Rahm appears to be pursuing aggressively. Time provides a factual account of the trials and tribulations of Emanuel’s first two rocky years, from the seven-day teacher strike in 2012, record-high homicides and violence, to the furor of black communities against him, so many of whose children’s schools are shuttered by the Mayor’s School Board. However, Time misses a beat when it comes to dealing with devastation and ongoing plight in Chicago’s poorer-urban-black communities, and the foreclosure housing crisis within. Decisions like his massive infrastructure plan “Chicago Forward,” funded by a public-private trust, which is estimated to reach at least $7 billion as the city faces an annual $650 million deficit under his management. 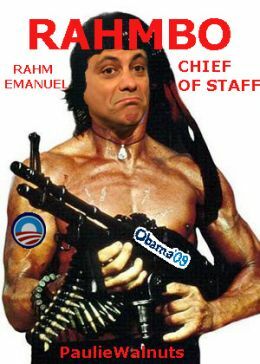 Never mind the fact that in no way would any Democrat operative in their right mind impose yet another Chicago wastrel on the nation at this time; this is about setting Rahm up as a heavy hitter, a man who turned down the presidency of the United States, no less. At the same time, he has taken on some very large issues, the kind Presidents give speeches about: education reform, job creation, unsafe streets. Revealing the stripes of a pragmatic, pro-business New Democrat, the mayor lengthened the school day for Chicago's elementary and high school students, reorganized the city's enormous system of community colleges to emphasize job-skills training and established an infrastructure trust to allow private investment in public-works projects. All of these are popular ideas among some Democratic policy mavens, but no other mayor has taken them so far, so fast. Rahm says he “is a wonk trapped in a hack’s body.” This, Time posits, “blends into a 21st century version of the classic urban boss,” alluding to time spent working for former Chicago Mayor Richard Daley, who was known for continuing the legacy of his father Richard J. Daley’s “political machine,” which others called an organized crime syndicate. "Each of those college presidents has construction projects they want to complete," he explains. "I just told them if they would help me, I'd have someone walk their plans through the permit process." They all assented, though he didn't have to say what might happen to those permits should they refuse. Time finishes off its piece with a quote from the Chicago mobster movie, The Untouchables: “you wait until the fight is over. One guy is left standing. And that's how you know who won." Perhaps you wait to see who writes the story of who won, and that’s how you know just how far Chicago’s tentacles have reached. Witness: Time. Former White House chief of staff Rahm Emanuel was elected mayor of Chicago on Tuesday, winning a simple majority of the vote in a six-candidate field, according to the Associated Press. The latest results -- with more then three quarters of precincts reporting -- show Emanuel running well above the 50 percent he needed to avoid an April 5 runoff. CNN projected Emanuel the winner shortly before 9 p.m. eastern time. Emanuel el chico malo de la administracion Obama, renunciara manana a su puesto de jefe de gabinete de la White House, y seguramente iniciara su campana para la plaza de alcalde de Chicago que segun el, ha sido siempre su sueno. No hay que olvidar que en el sistema politico norteamericano el puesto de jefe de despacho es equivalente al de primer ministro en los sistemas presidencialistas. Hijo de judios y con entrenamiento para participar en triatlones, Emanuel es bien conocido por su estilo de no tomar prisioneros. El joven bailarin clasico que fue alguna vez se convirtio en politica en Rahmbo, el individuo que le envio al mejor estilo de un verdadero Godfather un pescado muerto en una caja a un encuestador solo porque este se demoro en entregarle los resultados. O cuando con un cuchillo en la mano lo incrustaba en una mesa cada vez que se mencionaba a alguno de los enemigos politicos de Clinton despues de las elecciones de 1996. Quien podria reemplazar a Rahn Emanuel? 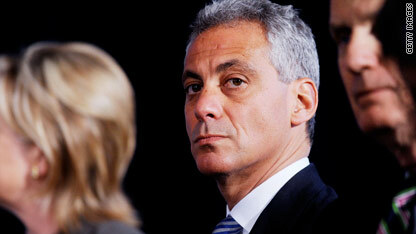 Who might replace Rahm Emanuel? The smart money in Washington and Chicago, Illinois, says it's all but a certainty that within weeks Rahm Emanuel will throw his hat into the ring to replace retiring Chicago Mayor Richard M. Daley. So the parlor game over who will replace Emanuel as White House chief of staff has already kicked into high gear.